Through the years, construction, pollution, over-harvesting, muck, algae blooms and a host of other factors, have conspired to taint the natural majesty of the Indian River Lagoon. But a committed group of scientists, engineers, coastal resource managers and educators has made combating these assailants their mission as members of the Indian River Lagoon Research Institute (IRLRI) at Florida Institute of Technology. 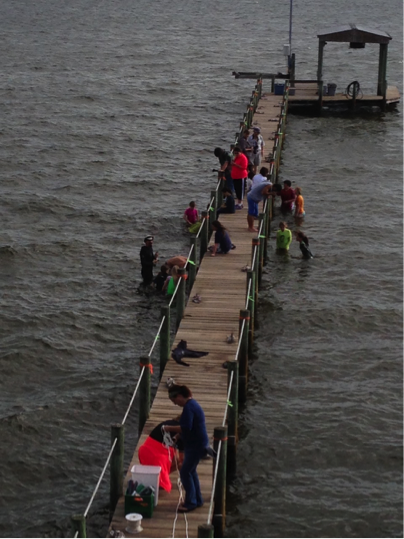 IRLRI members and a local Girl Scout Troup deploy a Living Dock. Through collaboration, they work to develop and implement sustainable solutions for the revitalization and maintenance of the lagoon. And they could use your help. The institute is seeking engineers, scientists, contractors, and students who are actively working and researching in the field of coastal water quality remediation and restoration to submit an abstract for a presentation during the institute’s third annual technical conference on water quality solutions –TechCon2017. Abstracts are sought that explore the use of available science to develop and implement solutions to water quality problems in coastal communities. Kelli Z. Hunsucker, Ph.D., is a research assistant professor for the Center for Corrosion and Biofouling Control in the Department of Marine and Environmental Systems at Florida Tech. Presentations can be in several different formats: oral, five-minute tech-teaser or poster. The deadline to submit an abstract is 5 p.m. on Monday, September 4, 2017. “We also welcome exhibitors who may want to showcase a particular product or method that improves water quality,” Hunsucker said. For those who are not interested in presenting – but are interested in the topic – the event is open to the public, but registration is required. For more information on abstract submissions, sponsorships or attending the event, please visit the event site.